Skillion Roofs are back in vogue baby! As Perth’s home designs take inspiration from the clean lines of the 1970’s, skillion style flat roofs are becoming more and more popular once again. 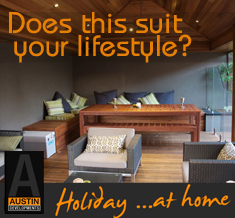 To reflect these new deign trends, Austin Developments have recently complete a number of backyard Gazebos, Cabanas, Pool huts and Alfresco Areas that incorporate the skillion roof design along with some new innovative building materials. This particular project features a new timber Glosswood lining product called “Possum matt finish board ” which has come out in a new range which offers earthy and different options to the ever present cedar lining . Custom Colorbond flashings enhance the clean lines of the roof with simple round steel column posts. View our latest designs including a Skillion roof cabanas and other displays at our Dolphin Pool Display Centre, Wangarra.